Mexico Busts Drug Cartels' Private Phone Networks Mexico's military recently dismantled phone networks that drug cartels were using in northern Mexico to assist with their smuggling operations. A number of telecommunications workers have been kidnapped in the past couple of years and were presumably forced to build these networks. 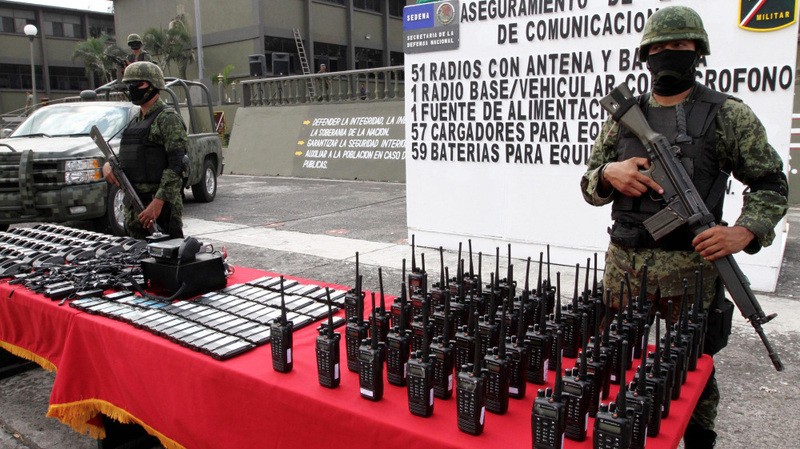 Mexican soldiers stand guard behind communication radios seized from alleged drug cartel members in Veracruz, Mexico, Nov. 23. The Mexican military has recently broken up several secret telecommunications networks that were built and controlled by drug cartels so they could coordinate drug shipments, monitor their rivals and orchestrate attacks on the security forces. A network that was dismantled just last week provided cartel members with cellphone and radio communications across four northeastern states. The network had coverage along almost 500 miles of the Texas border and extended nearly another 500 miles into Mexico's interior. Soldiers seized 167 antennas, more than 150 repeaters and thousands of cellphones and radios that operated on the system. Some of the remote antennas and relay stations were powered with solar panels. In announcing the operation, a spokesman for the Mexican army in Monterrey, Maj. Margarito Mendez Guijon, said the clandestine system allowed organized criminals to communicate throughout all of northeast Mexico. Military officials did not specify which gang built the network, but it stretched over territory that is solidly in the hands of the Zetas cartel, one of the largest and most feared in the country. In mid-November, the army shut down a smaller Zetas-run system in Coahuila near the Texas border. And in September, the Mexican navy pulled down 12 antennas allegedly put up by the Zetas in the Gulf Coast state of Veracruz. The Zetas were formed by members of the Mexican special forces who deserted to work as enforcers for the Gulf cartel in 1999. They later split from the Gulf cartel to set up their own criminal organization. Scott Stewart, a former special agent with the U.S. State Department and now an analyst with the private intelligence firm Stratfor in Austin, Texas, says given the Zetas' military background, it makes sense that they would want to have their own radio and cellphone networks. He says the Zetas commanders would use this system to control their troops on the ground. "This is battlefield control for when they're having skirmishes. This is control for avoiding this roadblock, that roadblock, getting on the net [and] saying you've got a patrol coming, the Mexican marines are in such-and-such a sector heading this way," Stewart says. Even if the Zetas encrypted these various communications networks, Stewart says Mexican and U.S. intelligence agents were certainly monitoring them. He says Mexican authorities must have decided that at this stage of the drug war, crippling the Zetas' internal communication was more important than eavesdropping on those conversations. The Zetas are the only cartel in Mexico to have their antennas publicly destroyed by the government. But Stewart says other gangs may also have their own private communications systems. He says there have also been systems like this built by rebels in Colombia. "Certainly in other places, in other countries, we've seen organizations like the FARC [Revolutionary Armed Forces of Colombia] set up their own radio communications network with repeaters and such in the jungles and the mountains," he says. Stewart says these networks are relatively simple to build and often use commercially available equipment. But the Zetas still needed technicians and engineers to design, construct and maintain their system. And it appears that they got at least some of this expertise through kidnappings. Over the past two years, at least 13 cellphone network technicians have been abducted in northeastern Mexico. None of them have returned alive. Two radio communication specialists working for the state-run oil company Pemex disappeared in 2010 and were later found dead. The other 11 remain missing. In the northeastern state of Coahuila, Blanca Martinez works with a support group for family members of the disappeared. She says in 2009, a group of Nextel technicians who were repairing cell towers in Tamaulipas were abducted from their hotel. Martinez says it wasn't a normal kidnapping. She says there has never been a ransom demand in any of the cases involving telecommunications workers. Martinez says this is quite unusual in kidnappings. Wives of several missing Nextel workers say they believe their husbands are still being forced to work for the cartels.